In Australia for the last couple of weeks news stories have focused mostly on the terrible flood situation in Queensland and the aftermath now that the waters have receded. One particular news story really caught our eye last Saturday night and I wanted to share it with you. In fact I want to share two stories with you because if a person ever had reason to be proud of their fellow citizens, this is it. It just makes me want to shout Aussie Aussie Aussie Oi Oi Oi! Now what did you think of that attitude? Talk about looking on the bright side of life. Instead of being devastated by the loss of her household items she saw it as an opportunity to declutter her life and move on to a new phase of living with less. I have to say I can relate to this. During one of our moves from city to city I found myself wishing that the container would fall off the truck and roll down an embankment causing no harm to anyone but destroying my entire shipment of belongings. Maybe this lady considers this more of a stoke of luck rather than a misfortune. Like the lady in the video suggested, it sure removes the difficult decision to dispose of those items around your home that you keep “just in case”. If this is the attitude to your belongings then maybe it is time to let go of the strings that bind you to them and purge. If you have been at your decluttering for some time and still having trouble separating through obligation to some things now is the time to forget the slow and steady approach and just bite the bullet and get them out of there. You are the one who has to live in your home and it should be under your terms not dictated to my friends, family or general consensus. You only get one chance at this life, live it your way. As the lady said “Less is more”. While watching the ABC News last Saturday night a woman appeared for about 15 seconds on the screen and I was thrilled with not only her attitude but also what she had to say. 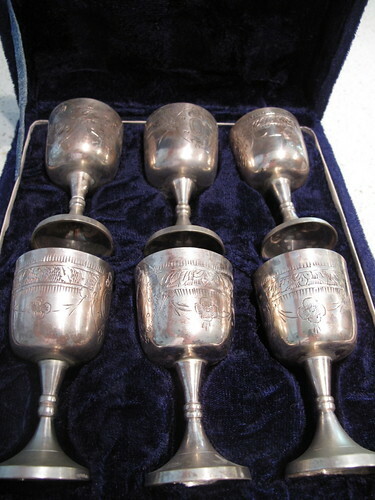 Nobody wanted these goblets when we put them up for sale on ebay but they snapped them up in and instant when I was giving them away on Freecycle. Have I mentioned before how I hate cleaning silver, well that is why they’re gone. The beauty of the human spirit – Sometimes it is more illusive than others but when the chips are down it is amazing what can shine through. Having the opportunity to help out a friend today – the giver always gets as much out of it as the receiver. It’s a good feeling to help. That my husband rode his motorbike to work even though it was threatening to rain – I had so much I needed the car for today. Freecycle – It is good to know someone will love the stuff I don’t. I don’t believe I have had the opportunity to welcome you to 365lessthings before so a hearty welcome to you. Thank you for reading and thank you also for dropping in and leaving a comment. I took a look at your blog and quite enjoyed it actually. Blogging about your decluttering can really keep you honest and on track so keep it up. You already have ten followers so you are doing well. 200 things gone already, you must be feeling the freedom oozing into you. It is a great feeling to be rid of all that excess isn’t it, less stuff to clean, less stuff to store, less stuff to concern yourself with in any way who wouldn’t want that? Good luck and we look forward to hearing from you more often. Great attitude! Sometimes when I’m having difficulty deciding whether to keep or toss something, I try to imagine how sad I would be if the item was destroyed in fire. That may sound strange, but it helps me. Also asking myself WHY am I keeping something helps. Is it because I like / need / use it or am I keeping it because I think someone else expects me to keep it. nothing strange about the fire question at all and the rest of your strategies here are great too. It is amazing how many things we own that if they were whisked away from us tomorrow by some strange event we might actually be happy they are gone. My daughter works with too girls who lost quite a bit in the floods. One girl was telling her about losing furniture and her partners work equipment in the garage and such and Bridget asked “what about all the little bits and pieces that you have collected over the year to make you apartment a home?” and the girl said “I know I really don’t care about any of that. I thought that said it all. That was amazing; I cried when I saw those videos but it was incredibly powerful for me. I just sent the waste disposal one to my husband saying that this is, ultimately, what happens to all our stuff – if not through some kind of natural tragedy or disaster, then certainly after we die. Just incredible, I really need to think about it and start re-evaluating ‘things’ more… Thanks fo sharing these. I have to admit when I saw the footage of all those trucks heading to the landfill I thought just look at all the stuff and a huge percentage of it is stuff that just wasn’t necessary in the first place. What a waste. When you see them walk into one of those homes and see the belongings all muddy and ruined you can’t help but think that maybe with the warning they had if we didn’t own so much stuff it would be easier to move it out of harms way in a situation like this. I just makes me want to keep at it because I am sure that there is still plenty of stuff left in this house that I wouldn’t bother trying to save under those circumstances. I saw her on TV and thought she was terrific – good work tracking the clip down! I used to be guilty of thinking a house fire might not be a bad idea (I got a divorce “declutter” instead). Now I could walk out on 95% of my stuff without a backward glance. The great thing about decluttering is that it actually frees you to see what is important among your things and then it gives you the time to take steps to safeguard them somewhat (ie digitise or store together so they could be gathered up quickly). But Mrs Green is right – we come into this world with nothing and that’s how we leave it, so we should put our focus on to the journey in between. I imagine a divorce would give you a chance to pare down your possessions. I suppose there is a bright side to everything. Wow. I think my favorite part when they described the clean up: one house, one street, one truckload at a time. Reminded me of decluttering under much less stressful conditions: one object, one room, one household at a time. I feel glad I am able to declutter at my own pace rather than being forced into decluttering while you are also having to scrub out or gut your entire house so you can live in it again. Wow, what an awesome comment, “I saw the footage of all those trucks heading to the landfill I thought just look at all the stuff and a huge percentage of it is stuff that just wasn’t necessary in the first place. What a waste.” So true. I really started thinking of decluttering years ago when my mom lost her parents and had to clean out their house. She came home to say “I will never do that to you”. I have no kids so I really don’t want to do that to someone either, since it most likely will be either a friend who’s stuck it out with me or a stranger. So in 19 days, I’m up to 260 items, after a few years of unquantified decluttering. Will get it finalized this year! we have talked many times here about that very situation and we have quite a number of our community who are decluttering with this as their motivation. I’ve been discussing on my blog and on others recently about the relationship between courage and desire in regard to simplifying. It sounds like even in tragic situations, some people can find a positive outlook, and the courage to move forward to a better life. This is another way that the journey to simplicity can start. thanks for dropping by. 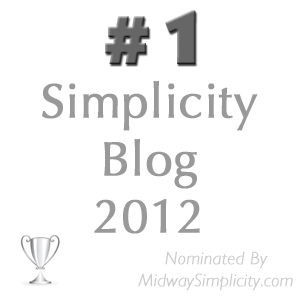 I took a quick look at your blog and liked what I saw and read. The photos just made me feel good inside, the beauty of nature can do that to a person. Your comment here is so true, there is often a catalyst that sets people on the path to simplicity. If I had to choose from your selection I would probably say mine would most likely be dissatisfaction but I am not sure about that. I hope you drop by and visit us often as I think you probably have quite a lot of good ideas you could share with us. a little enlightenment goes a long way sometimes. I bet there have been a lot of thing crossed off the inventory since then.